Once upon a time there was a single mom and her son. The mom had bad luck in the world of dating and the son didn't care for many of the suitors. One day, a mysterious crack forms in the ceiling. And a battle to patch the crack begins as mom meets repairmen turned lovers. And that's virtually all there is to James Harvey's The Crack in the Ceiling. 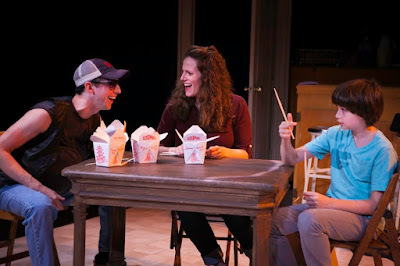 The Crack in the Ceiling is essentially a silly, frothy musical with a libretto that's filled with metaphors and corny jokes. There's not much substance and certainly a lot of repetition, but Harvey entertains nonetheless. The arc of the story focuses on the bond between mother and son. And that is why there is a crack. Is there enough of a story to fill a full length musical? It's up for debate. It's the cute score and the Broadway caliber company that fills the holes. With another pair as Ellen and the Man, it's possible that The Crack in the Ceiling would not be as well received. Josh Grisetti is comic gold. Transforming from fella to fella and giving each their own crazy personality, Grisetti has the audience eating of the palm of his hand. Kristy Cates as Ellen brings her sublime voice and beautiful aura to the role of lovelorn mom. Sure, her character may not be the most logical, but Cates had conviction and hope. Nicky Torchia filled the cute quota as David. He may not have always been in key but he always had the aww factor. Director Stephen Tyler Davis played up the comedy quota well. Even though the laughs were occasionally milked, the audience expected it. The set by David Goldstein was simple. The venue change may have worked in the productions favor as the smaller stage fit the intimate show. On the same hand, the lighting may have taken a tiny blow as the crack gobo was problematic. Davis had his company avoid it as much as possible but it's pretty hard to avoid downstage center. The Crack in the Ceiling certainly knows what it is. But is there an audience who will be demanding cute in today’s landscape of epic? It's hard to say.